This is NOT a Sponsored Post, just food for your spirit! Happy Monday Morning Butterflies! How was your Christmas? Did Santa treat you nice? I got to feed my soul with traditions that I enjoy (like opening a present before midnight, usually PJ's!) and surprisingly didn't put up a tree this year, I just plain didn't feel like it, some years I go through this - and I just go with it. It's been so long since I have done a Today's Inspiration that I really wanted to delve deep and bring you 'one to grow on' for today! I rarely do 're-posts' and 're-shares' on my blog pages, I post original content and that's the way I like it, but today two amazing women in my Facebook Feed shared this video from BuzzFeed on their timeline and it really got me thinking, so I re-shared it on my personal and blog facebook page. I went hunting for the original post that accompanies the video too! The post itself can be found HERE, it mostly posts the video and then the comments on the post are a goldmine in their own way. And a powder keg to a degree - but social media comes with it's share of good and bad. For women most Compliments center around our looks, on a physical attribute. But I'll bet the compliments that have stuck with you were the ones that had absolutely nothing to do with your looks. Ƹ̵̡Ӝ̵̨̄Ʒ - I always come to you when a need good sounding board because I know you will be honest. Ƹ̵̡Ӝ̵̨̄Ʒ - You are an amazing friend. Ƹ̵̡Ӝ̵̨̄Ʒ - Your perserverance never ceases to astound/amaze me. (Secretly this may be my favorite - I have had many bosses give me that one!). Ƹ̵̡Ӝ̵̨̄Ʒ - You are the most loyal person I know. Ƹ̵̡Ӝ̵̨̄Ʒ - You inspire me. FTC Disclosure: This is NOT a compensated/sponsored Post, All opinions are 100% my own! Tickets were provided for Editorial Consideration. I am disclosing this in accordance with the Federal Trade Commission 16 CFR, Part 255 - Guides Concerning the use of endorsements and testimonials in advertising, you may check our Giveaway and Disclosure Page for additional information regarding Ascending Butterfly Disclosure. I don't take compliments well at all, which is weird because I am a pretty confident person. The best comment I ever received was when I went out to eat with my three boys and my husband. They were 10, 8, and 3. At that time, they were all so loud and wild that we never took them out to dinner. LOL! I was stressed out, but an older lady came to my table to tell me how behaved my kids were! I was shocked and it made me feel so good! I think the best compliment I've received is the one where someone told me that they felt completely comfortable and relaxed around me. That they could share anything with me and not feel judged. I recently had a friend tell me that I was one of their truest friends - at first I just shrugged it off but after a while I realized how amazing that compliment truly was. The best compliment I ever got was when one of my clients told me I was the only other person in the world she'd ever trusted with her passwords. That was a pretty awesome feeling. No tree! I understand. Sometimes it is too much of a hassle to put up a tree. It sounds like you had a great Christmas. We had a pretty good one this year too. Happy New Yer! I always appreciate being called caring, inspirational, and of course, a good mother. My favorite compliments are definitely never looks related since outer appearances are temporary. I compliment people all the time, I do so without thinking. I didn't realize it until I read your post. I know what you mean girl! I love to give people compliments! It's amazing how much it lifts their spirits. Compliments are so rewarding to the personal ego. We thrive off of knowing that other people recognize our talents, appearance, abilities, etc. 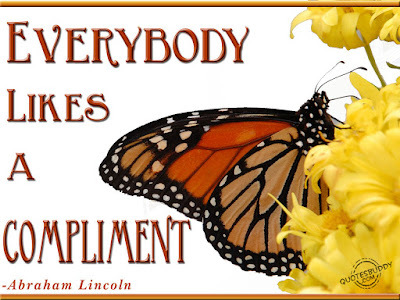 Because I tend to deflect compliments, I don't take them to heart and can't remember them! I know that's bad. I need to work on it. The nicest compliment was "I know you will make certain I get the care I need when I am no longer able to make the decisions myself." It's good to see you back. I cannot remember the best compliment I've ever recieved. The one I get most frequently is that I am a good listener. I love this post! The video is perfection too. Appearance compliments, though appreciated, pale in comparison to those about someone's essence. I always try to be kind to others. You never know when a smile will change someones whole day. A complement always makes me feel good. The best comment i got was about my kids behavior. It makes you feel good. Ya know, I can't even think right now of the best compliment I've ever received. But I am loving all these different compliments that were given! I always get complimented on my smile. So I do my best to always compliment people when they seem to be having a bad day. They perk right up. I love it!! My favorite complement was given to me by my mom just before she passed ; she said that she new I was an amazing mother and that my child was lucky to have me help her grow from child to adult !! Her complement always made me feel so proud that my mom could see that in me ! The best compliment I got is from my husbnd and kids. Being appreciated and complim;ented for the things you do makes you feel awesome! This is so true that we remember the comments that have nothing to do with looks or it is true for me. The best compliment I have gotten was by a good friend of mine that said she knew I would always be there for her when she needed me. Thanks for the insight. I don't take compliments as well as I should. I worry to much about what other think of me. This is such a great reminder. A few words can reshape someone's day, if not leave a lasting impression. I need to make an effort to slip more compliments in. Compliments are so important. They quickly make people smile, and brighten their day. I love giving out compliments. I think it can really make someones day. I don't always take them well myself, but it's nice to make someone happy. I don't remember when the last time was that I received a compliment, that's not counting my husband. He is always complimenting me! I couldn't agree more! Those type of compliments always leave a lasting impression with me, too.